Is your social media feed flooded with advertisements for personal organizers and planners? Do they promise to make this year better than the one before? Have you had the experience of feeling like you failed when you invested in a system that you completely abandoned by March? Until it hit me that I might not be the problem. What if the challenge with dayplanners isn’t in the planner itself, but in the box it forces us into? What if our brains are looking for something a little less structured? What if the perfect planner isn’t a system full of lines and prompts, but it is just a book full of blank pages? You know. Like a sketchbook. I stumbled onto the power of trading my planner for a sketchbook, and learned it works WAY better than a traditional planner. And as I started researching why, I found there was serious science behind its effectiveness. 1. Drawing creates a “state” change. Drawing shifts us from the left brain (the side of the brain that governs analytical thought and language) to the right brain (the side of the brain in charge of perception and meaning). When we write something down dayplanner-style, we begin with the left brain in our thinking, but the moment we leave language and enter the world of symbols and embellishment—such as in drawing or doodling—we engage the right side. “Whole brain” thinking (using both sides) creates richer context for whatever we are capturing—which helps us remember it. And—you guessed it—makes it way more likely that we will follow through. 2. You don’t have to be an artist to leverage visuals. You aren’t using a sketchbook to create art. It’s just a handy way to carry around a volume of blank paper with you so you can scribble down whatever you want to remember. Besides, if you can write the letter M and the letter Q, you have all the skill you need to break out of the confining dayplanner boxes because it means you know how to draw lines, angles, and circles. A sketchbook let’s your brain keep track of things in the way it is “seeing” them in the moment. Sure, you might write in a linear list, but you could also create a flow chart, use stick figures to illustrate a simple concept, or promote and demote information based on whether you write things large or small. Instead of forcing your brain to think in someone else’s system you create your own in the moment. 3. Our brains process visuals faster than text. My favorite part of using a sketchbook instead of a traditional planner is that I’ve discovered it’s fast—not only for the capture, but also for the recall. Neuroscience research from MIT has found that the human brain can process entire images that the eye sees for as little as 13 milliseconds; yet processing text takes 225ms when we’re reading silently. By adding visuals sketchbook-style to your dayplanning, you make the pages easier for your brain to handle. Magazines have been making use of this fact for years. It is much faster for people to consume information through layouts that include headers, subheaders, callout boxes and photographs than it is to get through dense blocks of text. Of course, you already know this because it is faster to process People magazine rather than the last textbook you cracked. 4. Visuals can reveal the underlying structure better than words. Have you ever tried mind-mapping? It’s a technique for brainstorming ideas (usually with software, whiteboards or sticky notes), then organizing the ideas by linking similar thoughts together. Mind-mapping is a popular technique because it reveals the underlying structure of ideas in a way that lines of text or spoken words cannot. When we think on paper without lines, we get to break the form of linear text and add a third dimension where we can see how ideas relate to each other. We can draw arrows to connect thoughts and add boxes to separate things on a page. Blank paper gives your mind a playground of unstructured space to create in. 5. We are biologically wired to be visual. More than 50 percent of the surface of the brain—the cortex–is devoted to processing visual information, but the more interesting thing is how visuals stimulate our thinking processes. One of the findings of a University of Toronto study was that the part of our brain involved in higher-order conceptual integration of information is stimulated through the viewing of art. The same study also suggested that viewing art triggers the part of our brain linked to our inner thoughts and emotions. 6. It feels more fun. Planners can feel like the photocopied worksheets we used to do in school. Which creates a problem for us. Because the subliminal connection to all of those hours you sat trapped at a desk in school waiting for the bell to ring works against you when you want to create inspired action. A blank page feels different. And when you add color—whether via colored pens, pencils, markers or crayons—the feeling actually improves. Instead of working through a dreaded worksheet, you start creating possibility. 7. Adding simple sketches takes us off of autopilot. Our brains shift into autopilot for repetitive tasks. It is efficient. After all, if we had to wake up every morning and really think about removing the toothpaste cap, putting the paste on our brush, scrubbing each molar, and rinsing our mouth out, we would never get anywhere on time. This ability to automate saves time and frees up our mental resources for other things. When this happens all the time, our days blur together. We move from task to task to task—feeling like a hamster in a wheel. Doing something different—like making yourself draw when you are used to writing—requires more attention and engages you more deeply in what it is you are trying to process. 8. In a digital world, tactile feels simple. Does it seem curious to you that the more digital our world has become, the more popular printed journals have too? There is something to the kinesthetic act of touching paper. We enjoy the physical experience which connects us more deeply to the content. It also feels simpler. After all, it is easy to pick up a pencil and make a line on a piece of paper. You don’t need an app. You don’t need to remember your password. You don’t require WiFi or even electricity. You have everything you need in your own hands. Don’t get me wrong—I love my screens. But I’ve found that the more reliant I’ve become on my digital assistants and all of the magical things they do, the more my brain appreciates the physical simplicity of crayons and paper. 9. It changes the angle of observation from inside of our head to outside of us. Most of the time, we solve problems in our heads, but drawing them on paper shifts us to an outside perspective. And guess what? Externalizing something helps us see it more objectively. Have you ever had a friend tell you a problem they were really in knots about, and once they said it out loud the answer seemed so…obvious? We can do that for ourselves by thinking on paper. As we spill out words or draw symbols, we see it outside the normal restrictions in our heads—which often helps us rapidly discover better solutions. 10. When you design the system for yourself, it fits perfectly. No one has a life exactly like yours. And no matter how great or customizable the planning system you purchase, it is always a mirror of someone else’s life. Dayplanning with a sketchbook allows you to include only the elements you need. It facilitates creating in real time. And most importantly, if you find you need the boxes, you can always pick up a ruler and draw them. Best of all, you won’t find yourself abandoning your dayplanner by March. Instead, you will be creating a system as you need it that actually works for you. I did this five years ago and it changed my life. I didn’t just write the words—I embellished them. I made bullet point dots in color. I boxed important information—with a crayon. I used arrows, bubbles and connecting lines to connect ideas and work through problems. I scribbled simple doodles. (Seriously, the simplest, worst doodles you could imagine.) They anchored information on a page and usually represented something to make it easier to remember. I remembered tasks. I got better at habits. I clarified what mattered to me. And—most importantly—I wound up creating a life of intention because I could “see” it. I didn’t have to get organized. Suddenly, I was organized. You don’t need to buy someone else’s system and invest hundreds. You can literally pick up a $15 sketchbook and some pens (or a box of crayons like I did) and do this yourself. 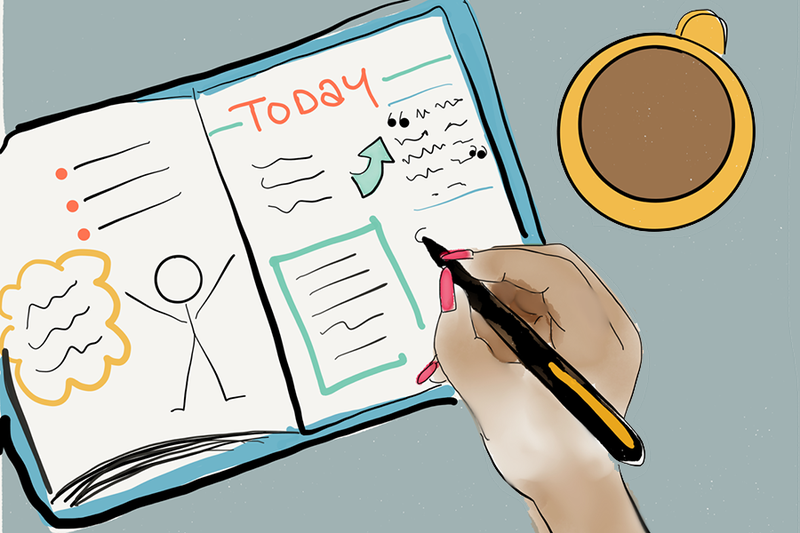 Using a sketchbook instead of a dayplanner will be WAY more effective, because it will work exactly like you do. Curious about practical examples for using a sketchbook as a dayplanner? Get your free e-book: 11 Visual Journal Examples to Get the Life You Want.